Since there seems to be a bit of a lull as far as U2 is concerned at the moment, we decided to drag up an old article and maybe add a little more discussion. The article, which originally appeared in the New York Times, speaks of the organisers of Ozfest and their quest for fresh blood. More interestingly, it goes to explain how all the big audience pullers these days (U2, Madonna and Metallica to name a few) are all the same bands that were big audience pullers 10 years ago. While there are newer bands such as Coldplay or the Killers emerging, these bands simply don’t seem to have the same crowd pulling abilities as a band like U2. And that specifically is an interesting view that may have some truth in it. It’s undeniable that bands like U2 or Madonna easily sell out complete stadiums, but who’s there to take their place. Much as we’d like to see U2 go on forever, realistically, there will be a time when they call it quits. And then what? Is there a future for stadium concerts, or concerts at all and will any band ever be able to live up to U2? You may remember our previous discussion on Rick Rubin and how you’d feel about him producing their next album. Well, all those in favour may find a little surprise, spoiler and delight in the following article discussing Wisconsin-based band the Robins. Seems our gut feeling was right once again. Overseeing the album is Greg Fidelman, an engineer/producer who worked with Rick Rubin on albums for the Red Hot Chili Peppers, System of a Down and Audioslave. The Robins and Fidelman will be ensconced at Sound City studio in Van Nuys (the same place where Nirvana made “Nevermind” and Tom Petty made “Wildflowers” and “Damn the Torpedoes”) through the end of the month and again in October. Why not September? Because Fidelman and Rubin have to go to London to engineer tracks for U2’s upcoming album at Abbey Road Studios. Let’s play “guess the new album title”. Oh, and thumbs up to the Robins. Have U2 gone too commercial? It’s been all over the news in the past few days. 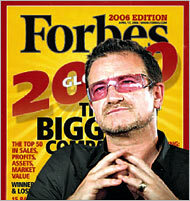 Elevation Partners, an investment group that Bono is involved in, buys up a large slice of Forbes. Forbes magazine often gets referred to as the “bible of capitalism”. At the same time U2 Unlimited, the company that holds all the rights to the U2 master tapes, moves to Holland to avoid a change in Irish tax laws, rising a lot of criticism from Irish politicians. And to top the bill, there’s that damn “U2 Tower” no one in Dublin really seem to want, other than some politicians and the band themselves. The Guardian does a great job of summing up all the controversies in this article. A lot of criticism is being voiced over this. Is this the same Bono that helped stage Live Aid, or the Drop the Debt campaign? Surely he could not possibly be avoiding taxes by moving a company to the Netherlands, right? And once again, we got thinking about this. 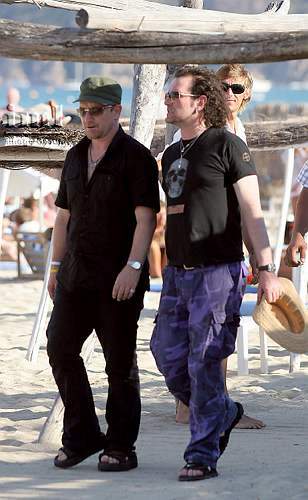 Bono is often criticised for being involved in all this charity fund raising money, but then being obviously, some would say filthy, rich himself. Avoiding tax schemes and investing in the “bible of capitalism” surely can’t help this. But is it fair? Does having a lot of money and preaching against world poverty make you come across as a hypocrite? It’s certainly what the press makes it out to be. It’s a discussion that’s often raised and that probably everyone has an opinion of and we’re interested in hearing it.